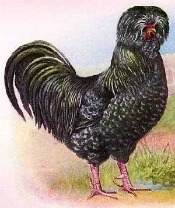 The Houdan chicken breed is an ornamental breed that was developed in France. The breed has a remarkably gentle disposition. Size: Standard Male: 8 Ibs. / Standard Female: 6.5 Ibs. / Bantam Male: 34 oz. / Bantam Female: 30 oz. Comb, Wattles & Earlobes: They have a small V-shaped comb resting against the crest and small, well-rounded wattles. Their small earlobes are hidden by the crest and beard. The comb and wattles are red and the earlobes are white. Color: The eyes are reddish bay. 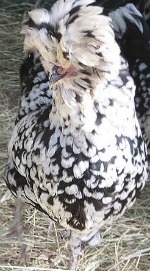 Mottled: The beak is dark horn and the shanks and toes are pinkish white mottled with black. They have standard mottled plumage. White: The beak, shanks, and toes are pinkish white. They have standard white plumage. Special Qualities: Very gentle birds. This breed was named for the town in France of the same name, which lies about 100 miles away from Paris. The city was long associated with poultry and supplying Paris with both eggs and meat for many years. No one is certain when the breed was developed, but we do know that it is very old. This breed is dual purpose and is a good layer of eggs and hefty enough for a meat bird. It is believed that this bird was developed from crossing Crevecoeur and Polish breeds with other native five toed fowl. The breed made its way to North America in about 1865. The breed is both stylish with their crest of head feathers as well as functional in a dual purpose situation for both meat and eggs. They are also quick to mature. They tolerate confinement, but excel in free range situations and can obtain the majority of their nutritional needs when allowed to roam. The hens lay a reasonable amount of small to medium-size eggs and continue to lay into the winter. The hens do go broody. The breed was first admitted to the APA in 1874.